Winters in Canada are tough, but so are the people! 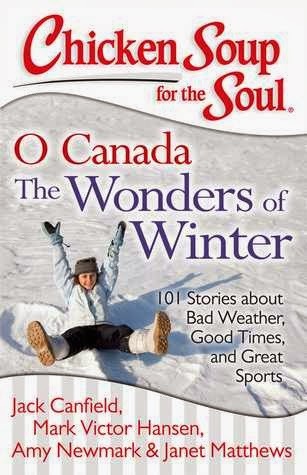 Any Canadian; from east to west coast; from city to rural; will love the 101 stories in this new collection about embracing those long winter days and making the most of them. Filled with amusing and encouraging stories about weathering the cold, creating warm memories with family and friends, and playing great winter sports. I have been reading Chicken Soups books for almost 15 years and slowly over the years I have stopped but boy can I say this book has given me the itch to start reading them again. This book was wonderful, bringing us the joys of family, friends, traditions and other winter excitement. The stories hit close to home with my father and his love for Canadian hockey or us as little kids and going sledding. The stories from all over the country and others telling their stories from wearing parkas, to being in winter plays to just the joy of snow and heart warming life is. Definitely a great to read over the Winter! Disclosure: All opinions are my own. I received Chicken Soup for the Soul: O Canada The Wonders of Winter at no cost for the purpose of this review. No other compensation was received.